… to redirect visitors to particular pages on the vendor’s site. This post is about how to create affiliate software for Clickbank vendors that allows affiliates to sends visitors to particular pages on the vendor’s site and receive credit, i.e. affiliate sales, for those visitors. 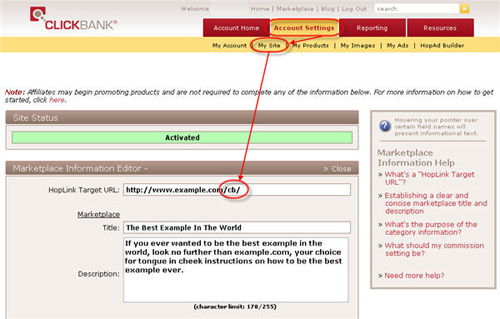 Now why would a Clickbank vendor want to allow this – could this be a Clickbank scam? No, no, no. Get your mind out of the gutter. This is not a scam. This is a way to let affiliates send visitors to the pages on the vendor’s site that converts the best (for that particular affiliate). Or – hold on to your hat – even to the payment page (if the affiliate thinks a presell page on her or his site can convert better). Let’s be honest, not every vendor has a sales letter that converts very well. Why not let the affiliate do a presell and send the prospect to the payment page right away? You can, and it is easy to do. A simple change to the Clickbank vendor’s site information, a new page on the vendor’s site and you’re in business. The vendor logins in to his or her account, clicks on the”Account Settings” link at the top of the page, then clicks on “My Site” and modifies the Hoplink Target URL. Time to make a slight addition to the vendor’s website that handles the redirect. The vendor adds a subdirectory to the web page – in this case a directory called “cb” <- that’s what the vendor changed in the url information page at Clickbank. The index.php file gets uploaded to the cb directory. There are a few changes that need to occur to the content mentioned above. The first and most obvious is to change the example.com domain to your domain. The second is to modify the contents on lines 3, 4, and 5 to your information. And correspondingly, you can remove some of those pages. Once this information is added to the index.php file, upload the index.php into the cb directory. So How Does This Clickbank Affiliate Software Work? Now it is time to inform your affiliates that they have options when they send visitors to your site. Try it for yourself, here are some live links that will direct you to a particular page and the affiliate will receive affiliate credit for any sales that result even though the arrival page isn’t the first page the visitor sees. Here’s the same links as before, this time encrypted using Clickbank’s Hoplink Shield. Here’s a simple form to fill out that will create the directory and file you need to upload to your web site to allow Clickbank affiliates to direct link to ANY page (well, there is limit of 3 pages in this case … try out the premium version for all pages) on your site and still receive affiliate credit. What are you (you the Clickbank vendor) waiting for, try it out. Dave, you are a genius! Thank you so much for posting this information. It works perfectly! My affiliates and I needed to separate traffic for English and Spanish sales pages and it is such a big relief now. Thank you again!!! Great job on your part selling an English and Spanish version of your product.